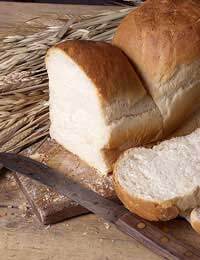 We're always told that the smell of fresh bread baking in the oven is pretty much guaranteed to get prospective buyers who are looking around a house making an offer before they've moved from the kitchen. Whilst this might be a slight exaggeration the claim does have some backing. It really is one of life's great smells and there's a lot of satisfaction to be had from preparing a sandwich with homemade bread, still warm from the oven. Whilst bread-makers are fantastic if you plan on making your own bread every day, there's no need to buy one if you just fancy doing a bit of baking once in a while. Bread is pretty easy to make, as long as you stick strictly to the ingredients and timings. It might take a couple of practise runs before you really get the knack, but you'll soon learn the recipe off by heart and the actual preparation isn't that long at all. We've just included a recipe for a basic bread here, but obviously, if you get into baking in a big way you can try all sorts of flavoured breads, as well as different varieties such as ciabatta, granary, sourdough - the list is endless! Pour the water into a large bowl and add the sugar and yeast. Use a whisk to mix well then cover the bowl with a clean, damp tea towel and put it in a warm place for about 20 minutes until a froth develops on top (a linen cupboard is ideal). Whisk the mixture again, then sieve in half the flour, along with the salt. Mix well with your hands and then gradually add the remaining flour. Once it's all added, take the mixture from the bowl and knead it well on a floured surface. You'll need to do this for about ten minutes (good for the muscles!) until you have a nice elastic dough. Place the dough in a clean bowl that's large enough to take double the size. Cover the bowl with the damp tea towel and put it in a warm place again for about 30 minutes, until the dough has risen (roughly doubled in size). Divide the dough in half and put each piece into a loaf tin, then once again leave in a warm place for 30 minutes to rise. Preheat the oven to 200C400F/Gas Mark 6. Cook the bread for about 30-40 minutes. Check it after 30 minutes. If it's cooked through, the loaf tin should sound hollow if you tap it on the bottom. If it's not ready check again after a further 5 minutes. Once you get confident, you can start adding extra ingredients, such as dried fruits, chopped nuts or seeds, to customise your bread to your own taste. Serve it while it's still warm for a real lunchtime treat, either as a sandwich or to dunk in soup.